How to Stop Missing of Garments in Production Processes? Most of the garment export houses have a common story at the time of shipment offering to the buyer's quality auditors. Buyer quality inspector waits at quality inspection room for full shipment offer. People in the finishing and packing department try hard to complete finishing and packing full order. Few people are busy in counting total packed pieces and to be packed pieces. But their count doesn't match with total cut quantity. Even the packing department doesn't get pieces in all sizes as per ordered size ratio. People then rush to all departments - stitching, washing, repair section, meeting room, merchandiser’s cabin to search for missing garments. The shipment has to go on time. So they offer shipment for inspection whatever quantity they had packed. Many pieces are still missing. At that time they decided that they will find out all missing pieces after shipment. But very few factories do that after shipment reconciliation of the cut pieces. This happens because no department keeps a record of the received quantity from the previous process and the number of pieces sent to the next process. And those who note down all transactions do not tally with the order quantity – how much they are supposed to get or how many pieces they have to send to next department. They don’t bother to check if they don’t send all received quantity and where they lose those pieces. In principle, the factory must keep a detailed record of each and every piece. Because, when they sell a piece they earn money from it. And a lot of costs is involved in making a piece – from raw material to processing costs. Factories those are facing this problem; I will suggest them to implement a simple format “Order Tracking Sheet (OTS)” that will help to keep a record of each and every piece. Later this format will help the company to reconcile fabric as well as garments. How to use OTS format? Following steps must be followed religiously by each department as mentioned in the following paragraphs. Job responsibility may vary according to the company organization structure. Merchants: First, a merchant will create an order tracking sheet (OTS) and give it to the production department with the production file. They have to enter only style name, color wise quantity break-up of each size. Planning Department: At the time of giving cutting plan or style cut ratio, OTS will be given to cutting department, OTS must be filled with to-be-cut quantity against order quantity. Cutting Department: They have to fill OTS according to pieces they cut and give to production department (sewing line). For multiple transactions cutting department will take the signature of production department against the transaction quantity. At the time of completion of style OTS will be handed over to the Production department. Production Department: Production department has to check whether they have received cut quantity as per written in OTS or not. Like cutting department, when sewing department sends stitched garments to finishing (or washing), they have to write how many quantities they are giving to the following department. If they lose any pieces they have a written comment for lost pieces or sample pieces. Finishing Department: Finishing department has to check received quantity from the sewing line. Whatever pieces finishing department received, they need to tally those pieces with actual order quantity with color wise and size wise. If they received short quantity they may demand balance quantity at this time instead of searching for pieces during shipment packing. In this method, the factory can keep the record of each and every piece. Even they lose some pieces in the processing they have a record of those pieces, whether pieces are sent to buying the house for approval, pieces get damaged in sewing line etc. Order Tracking Sheet format. Click on image to view in full size. Online Clothing Study: How to Stop Missing of Garments in Production Processes? 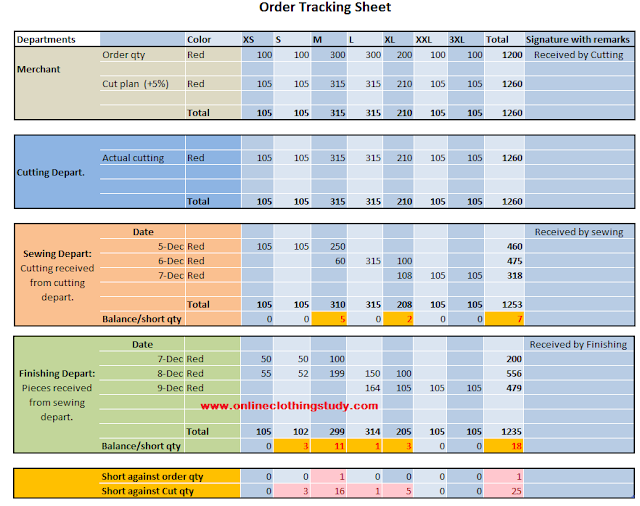 How to keep track of 100 percent garments from cutting to shipment process. A order tracking format is shared in this article.